Rise Crispy Treats have always been my fiancé’s favorite, especially the chocolate ones. The other night he got this ridiculous craving for chocolatey treats and guess who had to go to the grocery store at 9 p.m. to whip up something good – me! 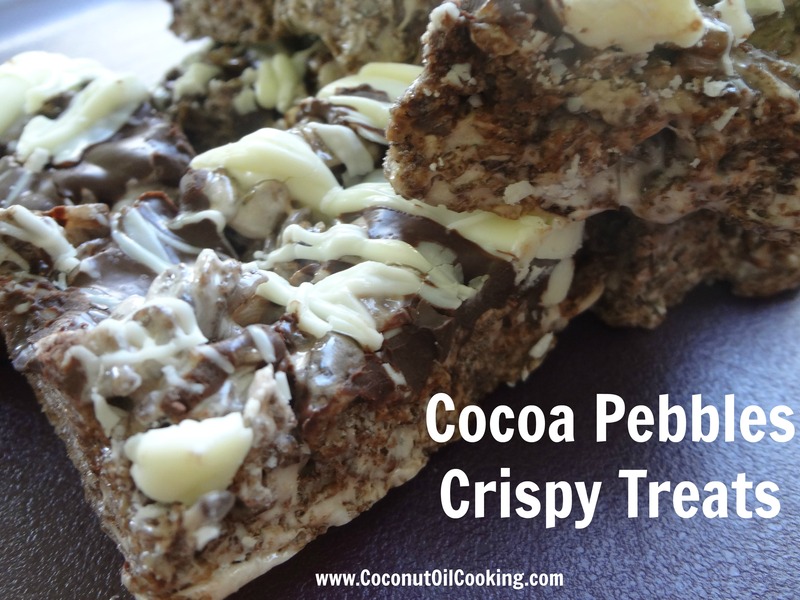 I decided that I would go about a different way to making these treats, getting a different brand of cereal and making the base with coconut oil instead of butter. I prefer to use this healthy fat in all my recipes now, especially when I’m baking. For any recipe, you simply swap out butter or oil for coconut oil in a 1:1 ratio. In a large sauce pan, add ¼ cup coconut oil and melt completely. Next, add in mini marshmallows and stir frequently until fully melted. Add in the box of cereal and mix well. All ingredients should be fully combined. Spray a brownie pan with Kelapo Coconut Oil cooking spray or line with parchment paper. Add in mixture to the pan and press down completely with spatula. In a small bowl, add in semi-sweet chocolate chips and 1 tablespoon coconut oil. Microwave or use a double-boil to melt, stirring completely to combine coconut oil and chocolate. Drizzle over the top of the treats. Once finished, place the treats in the refrigerator for 30 minutes to an hour to settle or in the freezer for about 15 minutes. Remove from pan and cut into desired pieces. Serve and enjoy! 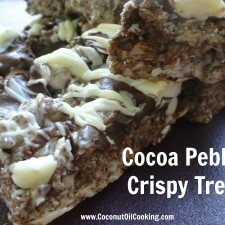 I took the route of placing these Cocoa Pebbles Crispy Treats in the freezer since my fiancé wanted them STAT! They turned out delicious in my opinion and I definitely couldn’t stop eating them. Overall, they had a good crunch and gooey texture from the marshmallow. I loved the melted chocolate over the top and my fiancé became obsessed with placing his portions in the microwave for 5 seconds to melt the chocolate. Hope you like these as much as we did!